One of the fundamental reasons why I find the notion of God philosophically unsound is because of either the tension or contradiction between the transcendence of God and God as a causal agent. The transcendence of God asserts that God is not only independent of the universe, but such independence is constituted by negative attributes or predicates that make God’s nature contrary to that of the universe. This dualistic understanding of transcendence makes it difficult to reconcile it with the other important notion of God as being the causal agent. God is immaterial (pure spirit) as oppose to material, immutable as oppose to mutable, and eternal as oppose to temporal. 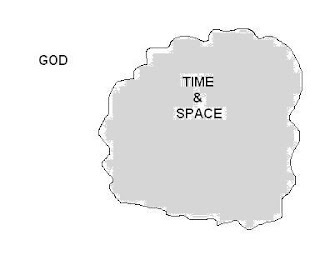 What each of these negative predicates/attributes of God suggests is that God is beyond the spatial-temporal reality because God is a non-spatial-temporal entity. However the problem with this view is that it is irreconcilable with the notion that God is a causal agent because causality is intelligible in the context of space-time. While causality is a difficult notion to define, ever since Hume challenged the notion of it, it is obvious that causality is at least understood intelligibly in the context of space-time. Causality is understood as the most fundamental state of affairs in which events can be said to connect to each other. It is not merely one event follows after another that constitute causality but rather how they follow from each other dictated by the laws of nature that determines the universal state of affairs of spatial-temporal fabric. The laws of motion are a classical example of the mathematical examination of the causal relation among mass of objects. The notion of physical energy opens up to several possible understanding of causality such as transference of energy, conversion of energies, and converting energy into matter and vice versa. There are, of course, a few exceptions since causality is not applied to quantum physics and the decaying radiation, but beside those exceptions causality is common in scientific discourse. If God’s attributes are such that we understand them to be non-spatial and non-temporal, then how do we distinguish that from merely not existing? Despite the overwhelming complexity of causality in the scientific view, it is plain that causality is intrinsically situated in space and time. To speak of cause is to say that one event at certain point in time and location of space is responsible for the transition to the next event; in other words it speaks about contingency within the preconditions of space-time. However if God is remote from this reality based on His nature, then how can we speak of God as causality? How can we speak of God as a causal agent without being part of an event? How can we speak of God as a causal agent and exclude temporality and contingency simultaneously? These questions are very difficult to answer, and the source of this difficulty lies in the contradiction between transcendence and causality. Transcendence implies negative attributes that is contrary to space-time, whereas causality implies temporal contingent events intrinsically occupying in space and time. To say that God is both a transcendent and causal agent is a contradiction in retrospect to the prior difficulties; it is an incoherent proposition. If God’s attributes are such that we understand them to be non-spatial and non-temporal, then how do we distinguish that from merely not existing? I will present another argument in this format: 1) anything that exists occupies space and time.2) God does not occupy space and time. 3) Therefore God does not exist. From our experience within this universe, we witness the existence of things, and every time we perceive existing things we perceive them in the dimensional fabric of space-time; We perceive them exist spatially and temporally. However what does it mean for us to perceive things to exist non-spatially and non-temporally? We can simply conclude that to exist non-spatially and non-temporally is simply non-existing. We can also say that to exist non-spatially and non-temporally is a contradiction since anything that exists intrinsically occupies space and time. At least from our understanding of the universe, existence is intrinsically associated with space and time, and consequently it seems inseparable from it. However we cannot apply this understanding to God at all, so what do theists mean when they say “God exists”? God, then, is an incoherent concept. If God is an incoherent concept then it follows that God is also an incoherent explanation for the existence of the universe since God cannot both a causal and transcendent agent. Examining the strict understanding of the nature of both of them has lead me to the conclusion that both of them are mutually exclusive, hence cannot both predicate the same subject (God). Since I understand “existence” to be anything that I attribute to things that have consistently occupied space-time, I do not attribute existence to that which does not occupy space and time. It follows that for me to attribute “existence” to God is incoherent. Therefore I do not attribute “existence” to God, on the basis of how existence is intelligibly understood, and it follows from there that God does not exist.